As a person grows up, many of the things they enjoyed might disappear as they age. Some products are discontinued, or are just exceedingly expensive to the point where you can't indulge anymore. Such is the case with a lot of candy, ice cream, and other delectable desserts that are unfortunately gone at this point. I made this thread to reminisce on some of my childhood delicacies that i miss severely, and to hear about yours if you have any. Anyone who is anyone has heard of italian ice. It's a simple creation, only requiring syrup and well, ice to make a cheap cold concoction on a sweltering summer day. But i remember having it a different way. 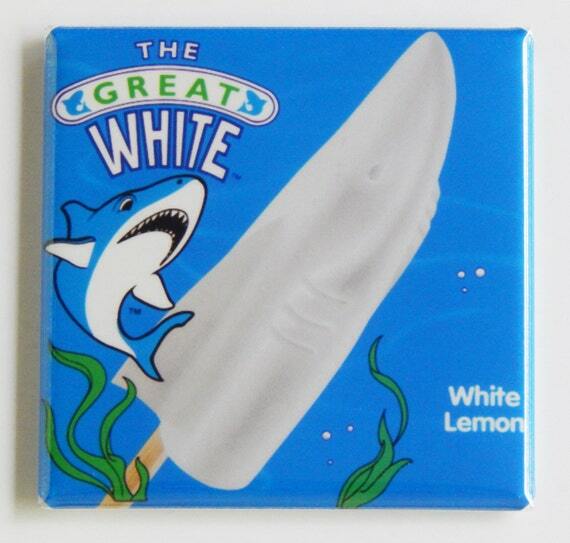 When the ice cream truck came through my neighborhood a long time ago, It used to carry something called the great white shark ice cream pop. It came in one flavor, was shaped like a shark, and was in my opinion, the BEST THING IN THE FREAKING UNIVERSE. good god how many times did i eat this thing? I'm a sucker for lemon flavored things and this was no exception. If i had a fridge filled with these things I'd be one of the happiest men on the planet. But unfortunately, it appears as though this frosty treat is no longer being made, as I was told one day in my youth. I was devastated to say the least. You don't know how good something is till it's gone. I can pretty much eat anything, but back when I was a teenager, I had quit butter and chocolate because they provoked acne. So during that period of time, I had quit it, so to speeak. Haha. For the longest time KFC had stopped serving hot wings...at least where I grew up they had stopped. I used to eat them all of the time as a kid when I was picky. Then they vanished for a long time and I forgot I ever ate them once they stopped serving them. Now that they've been back some many years, now, I can't eat them at all because they taste too salty to me and frankly I'd rather spend my money on WingStop wings than a gross fast food joint with their frozen refried wings. Altoids used to make Altoids-branded chewing gum. The flavor lasted about as long as barbecue at a wedding (which is to say, not long at all), but for the moments it lingered, your mouth was never colder. Also, something something szechuan sauce reference. hahaha , important topic . it is very important that people like you are. I like this topic. If you're laughing, then you shouldn't be writing here. Take the trouble to make at least an avatar so that people can understand you. I don't really drink soft drinks like cola anymore. It's pretty expensive. However, I wouldn't really want to drink it much because it still affects my skin, and I'm all about that skin care these days. You know, before I get all old and wrinkly and no one will have me. Lucas powder candy. Like, they technically still exist but the ones I used to eat as a kid are no more. I'm talking about the one with the yellow cylinder container. I'm pretty sure they can't sell this anymore cuz they literally had toxic chemicals in them though, so...yeah. You can still get the newer versions that have the blue and red top but they don't taste quite the same. Since I became vegetarian there's a lot of candy I can't eat anymore, since a lot of them contain animal-derived gelatin. Where I live I used to eat these things called Cadillacs from the brand Autodrop. They were amazing and I'm still waiting for them to make a vegetarian-friendly option. Anything that's glazed. My taste buds get repulsed with the glaze after flavor. I just can't anymore. No more glazed Krispy Kreme donuts for me, or Honeybuns. That;s a pretty strange looking candy, never heard of it, what did it taste like? Ah, being a vegetarian must be difficult due to the limited amount of options for protein and things of that nature. Gummy shaped cars huh? I've seen bears, worms, octopi, sloths and even sharks, but cadillacs is something i'd never expect! Man, that must be tough. I suppose I can kind of relate, I can't handle the starchy after taste in certain foods like tacos or quesadillas. It's really offputting for me. Though I never really enjoyed those foods to begin with, so I guess that doesn't belong here now that i think about it. Nope, not at all. Everything contains protein. Meat is just recycled protein. In fact, I easily go over my daily protein needs. Now I just get it straight from the source! I actually think being vegetarian is a lot easier since there's way more variety in my meals and I'm eating a lot healthier in general. And yeah, there's a bunch of different types of cars in their candy line lol. Trucks, regular cars, hell, even parking officers hahaha. I miss tuna. :'l I guess I could eat it, but don't do so by choice. There's some really good meat-alternatives, but for tuna, I still haven't found the one.